Stretching my Piriformis is always a difficult thing, mainly because it can activate my nerve pain. I usually try to strengthen my hip and Piriformis area instead of stretching it. Although, like most things I can go completely overboard with it. I’ve spent the last couple of months so focused on strengthening that I forgot to stretch. So when I met with my yoga teacher last week we went over a couple of different Piriformis stretches is to try to find one that worked for me without activating my nerve pain. The Piriformis is a muscle that connects your sacrum to your hip. The sciatic nerve runs in between the Piriformis muscles in the gluteus medis. This is the traditional Piriformis stretch that everyone is familiar with. 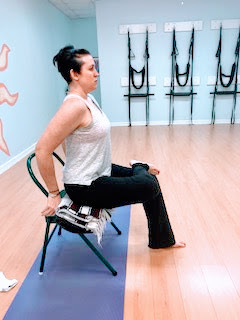 You sit in a chair you bring your leg up on your opposite knee and if you can, you’ve bend forward at the waist. My hypermobility makes this pose possible but it will always kick my nerve pain off. My yoga instructor tried to help me modify this and here is what we came up with. I'm practically lifting my spine up with my arms braced on the back of the chair. I'm extending my side ribs up and releasing the knee down while flexing my foot. It was still stretching it but was also stretching other parts of my body as well. I'm also sitting on a blanket to get a little higher than 90 degrees with my legs. This is the second most traditional Piriformis stretch that is recommended by physical therapists. You lay on your back you put ankle on top of your opposite knee and thread your arms through your legs and pull your knee up to your shoulders. This is one of my favorite stretches for the piriformis. My newest physical therapist told me this. You bring your knee up like you would in a traditional stretching pose, but instead of going to the same side shoulder, you go to your opposite shoulder. It doesn’t look like it, but in this picture I’m bringing my left knee up to my right shoulder. Now I bring us to our last pose. Similar to the threading through the knee pose, this time you’re using your leg as resistance. You’re going to start with one of your legs up the wall, laying relatively close to the wall. Then you’re going to slowly slide your leg down the wall until you fill a gentle stretch. This one is the least aggressive on the Piriformis and the one I like the most.